That’s it. The Ironman season is over. Ironman Western Australia brings a close to the year and a last set of fresh data to examine, for a few months at least. 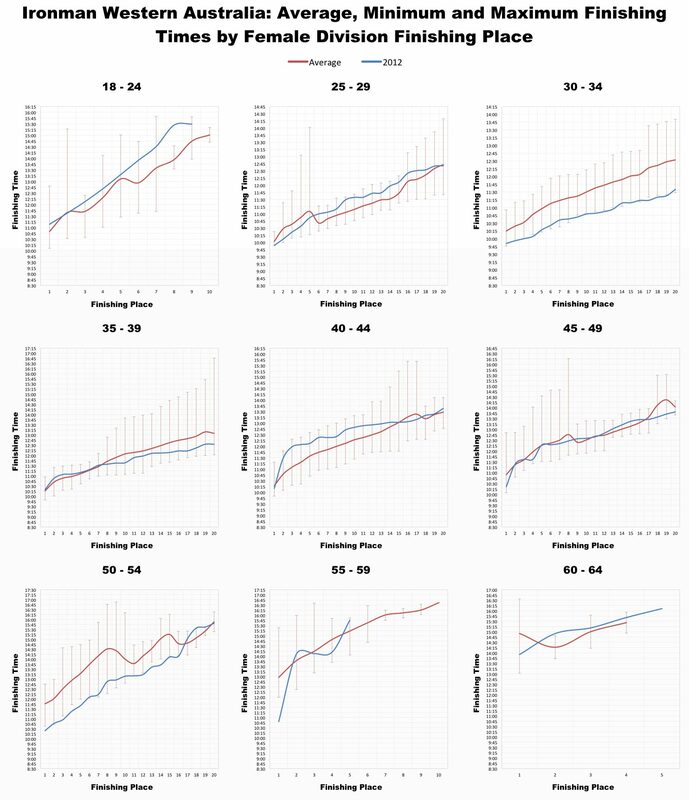 Once the race was finished I ran my scripts, fetched the results and spent a few hours cleaning data and plotting graphs. 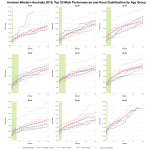 For those interested in a more accessible version of the results there is a complete set of Ironman Western Australia 2012 Results and Splits available on my Google Drive. 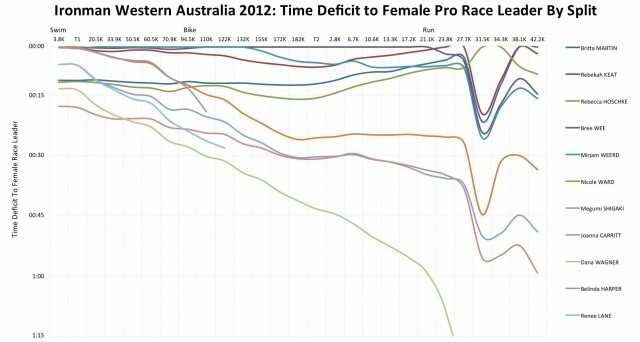 And, of course, for those who want more I’ve produced my usual sets of charts to look at the breakdown of the race. The reports I’ve read so far point to a rougher than normal swim, but otherwise a typical running of the Busselton event. 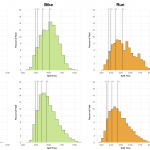 The charts above seem to support that notion: 2011 and 2012 show similar distributions at each stage of the race and we would be hard pressed to label one significantly faster than the other at any stage of the race. The trends hold true if you further compare with the historical charts from my last blog post. This is reinforced by examining the finish times of the top 20 in each age group and seeing how this year compared to previous events. 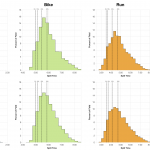 By overlaying the 2012 results on the finishing place charts I presented in last week’s blog we get a better feel for how the front-of-pack athletes performed this time round. 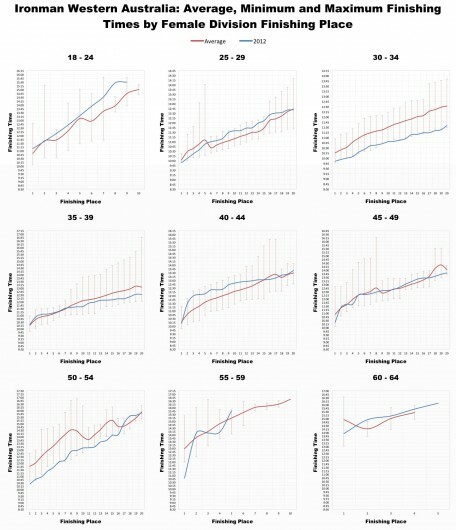 In the charts below the red line represents the average with red error bars indicating fastest and slowest times for that placing while the blue line represents the 2012 results. In general I am confident saying that performances were on a par with previous events. 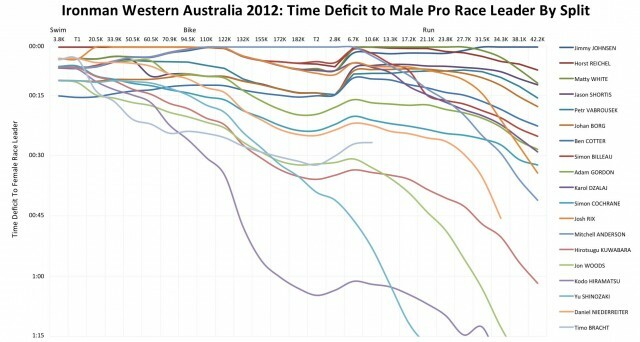 There are exceptions, once again demonstrating the difficulty of estimating finishing times from historical results. 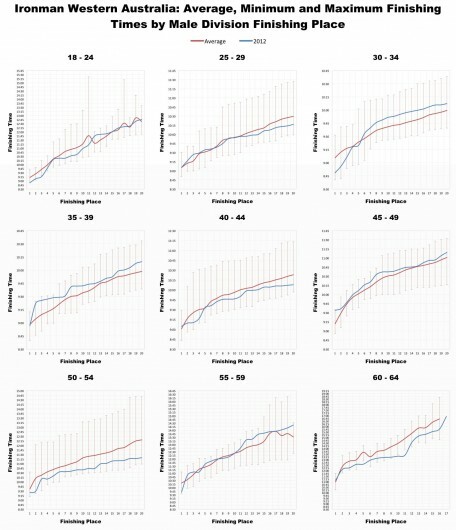 In most of the male cases the average is not a bad estimate of the outcome, but there are one or two exceptional cases in the women’s chart above. 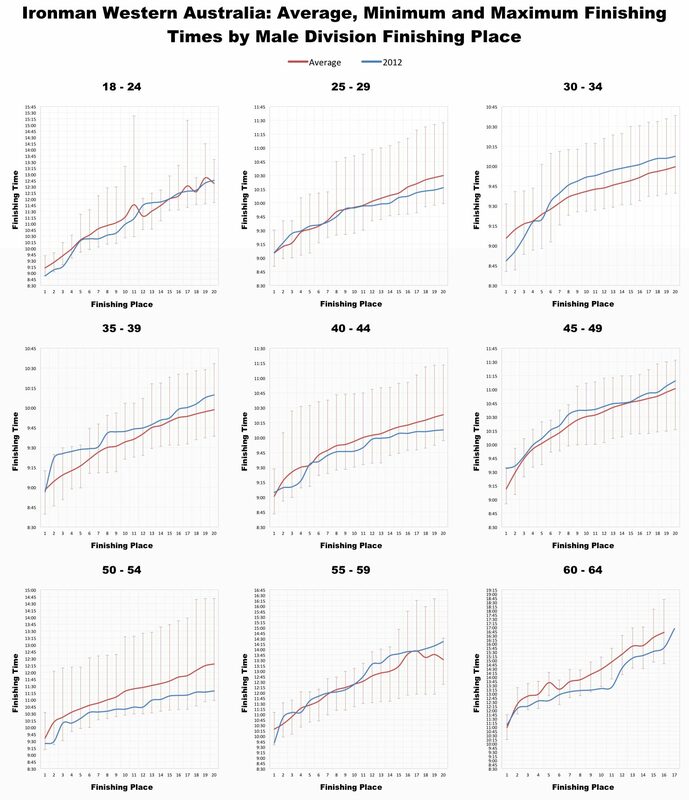 Both the 30-34 age division and the 50-54 age division outperformed expectations delivering results as fast or faster than previous bests, perhaps suggesting a higher quality of athlete leading those packs this year. 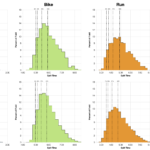 We saw the same in Ironman Cozumel’s results a few weeks back, most age divisions adhering to the averages, one of two, the female 25-29 being the best example, being significantly outside expected bounds. Last, but not least the professional field. 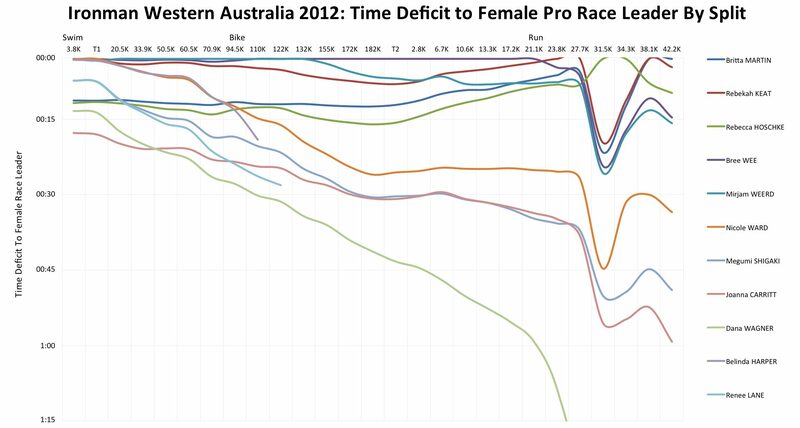 Mainly presented because I like the messy charts that plotting time deficits produce, although occasionally we might gain some insight into how a race unfolded. The overall men’s race is decided during the second half of the run when Jimmy Johnson takes the lead and opens a gap on the rest of the field. Outside of this the field slowly spreads as athletes open their leads over the course of the race. The small female field shows a similar outcome (and suspect timing data at 31.5K) there is little change in position over the course of the race, the decisive move coming in the final few kilometres when Britta Martin takes the lead. Until those last few miles the top 5 women remain in close contention for podium places. The end of the season isn’t an end to the data, I have an entire year of results to examine, there must be some potentially interesting information buried in there. And if I grow tired of that, there is an entire 70.3 series to examine too, my toolset can extract those as easily as Ironman.